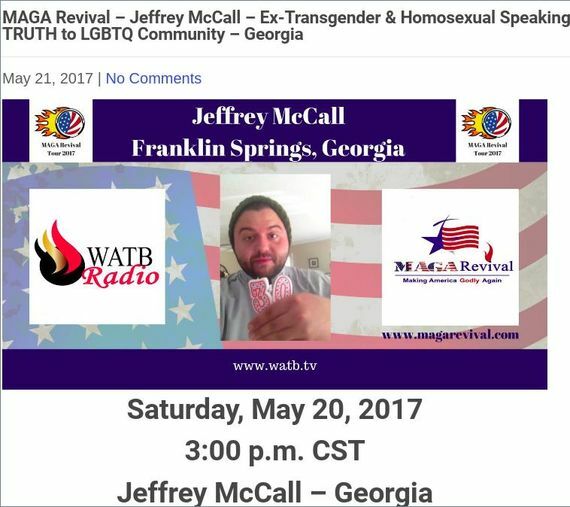 In 2017, Jeffrey McCall, claiming to be ex-gay and ex-trans for good measure tried to make something out of a MAGA Revival. Call me a cynic but Jeffrey McCall doesn't look like he has a pot to piss in. Someone or some group is bankrolling his so-called freedom marches in spite of the fact that the two he has orchestrated have been dismal failures. Image via LifeSiteNews - They can be more useful than a dead hamster. Not much better in Los Angeles in November, 2018. The one with the megaphone is a fruitcake named Mary Jenna or M.J. Nixon whose group is called Uprooted Heart. No one shows up at these events because most sane people realize that people are transgender because they suffer with gender dysphoria, a medical condition. Praying to Jesus, Moses, Allah or my microwave is not going to make the condition go away. I am reliably informed that there is a sometimes effective incantation but finding “eye of newt and toe of frog” is a challenge. McCall claims to be ex-trans. Was he diagnosed with gender dysphoria? By whom? Aside from being a ne're-do-well I suspect that McCall is full of crap. Nevertheless this douchebag is at it again. He has staged new events; DC again in May, St. Paul in June and Orlando in September. Someone is underwriting this idiocy. It could be an outfit like Alliance Defending Freedom or it could even be the U.S. Conference of Catholic Bishops. McCall is not paying for this. Chances are that McCall will have no greater success than he has had in the past. 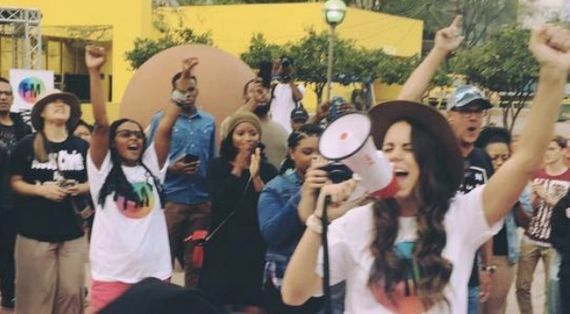 Meanwhile, according to Jessilyn Lancaster at Charisma, “hundreds of freedom marchers took to the streets of Los Angeles to share their stories.” Apparently Lancaster lacks the intellect to realize that there are not a whole lot of religious zealots claiming to be ex-trans who would be sharing stories, or anything else for that matter. Who took that count? Right because transgender people are possessed by Satan himself. What I find most remarkable about this is that anyone is stupid enough to believe this drivel. Jeffrey McCall, from Georgia, runs For Such a Time ministry. Is is not a federally recognized nonprofit. McCall claims that he was gay then trans. He also says that he was an alcoholic addicted to meth and prescription drugs. Mr. McCall does not seem to be gainfully employed. Mary Jenna Nixon (MJ), of Canton, GA, formed her own tiny ministry called Uprooted Heart in Canton, GA. It was approved as a 501(c)3 nonprofit in July, 2018. It is the recipient of donations to the marches which is a questionable scam. Jesus saved MJ from the Homosexual Lifestyle™. According to her it was a transformation from death to life. Apparently, according to M.J., speaking in tongues is of immense value in pray-away-the-gay endeavors. Nixon does not seem to be gainfully employed. 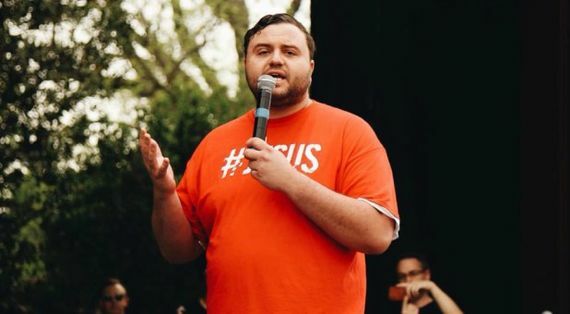 Edward Byrd, from Washington, DC, claims that Jesus “turned his pain and longing into love and purpose.” Byrd claims to run Red Hause, LLC which has no business license and no corporate record in DC. It also doesn't seem to have a web presence. Mr. Byrd does not seem to be gainfully employed. Kimberly Zember also claims to be an ex-gay who runs Overcome Ministries. Zember appears to have been a San Diego area real estate agent. Overcome Ministries is not registered as a California charity and has no business license. Someone or some organization is feeding all these nutty people. I guess that they are the ultimate suckers in this scheme.